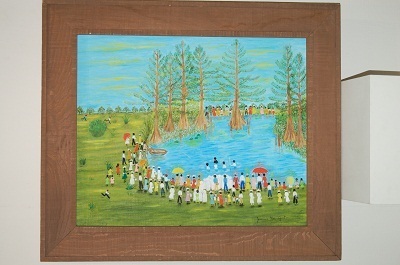 This vivid colorful piece painted in a most accomplished naïve folk style and presented in its rough cypress wood frame (26 x 30 inches) was originally given by the artist to the Oral History Program of the University of Southern Mississippi. The back of the piece is almost entirely filled with an explanation of the scene and the scenery. Jennie Lee, born Wharton in Pine Bluff, Arkansas, wife of a traveling salesman Doy Gorton, saw her work as an ethnographic document about the African-American population in the Mississippi Delta, as much as the artistic achievement of joyful fictional character. The Museum of Art joins a consistent group of museums in Mississippi and Arkansas to possess a work by this artist, as well as the White House and the Smithsonian Institution in Washington, D.C.